The Olympic Games are an exciting global event. The competitions test and showcase the strength, talent and endurance of the participating athletes. 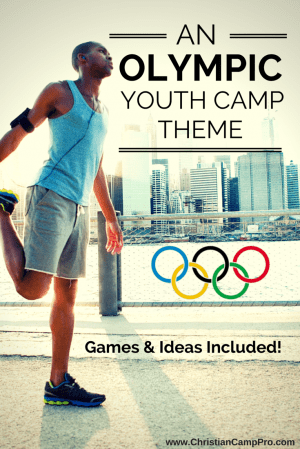 A youth camp with an Olympic theme could be a perfect way to get teens to “put their game faces on” and join in some competitive fun. Teens usually need a little encouragement to join in activities, so a little friendly competition can be an excellent way to get them off the bleachers and onto the field. An Olympic themed youth camp can also be adapted to not only test teens physically, but spiritually as well. The teenage years involve proving one’s worth and place in society, so giving teens physical, mental and spiritual challenges can be greatly beneficial in helping them learn their strengths and weaknesses. The Olympic theme can be modified many ways to teach different lessons about physical and spiritual strength. For instance, Hebrews 12:1 would be a great theme verse to use to teach perseverance and overcoming distractions. 1 Corinthians 9:24-27 could be used to great effect as a theme verse passage for teaching the importance of discipline and self-control. Marathon: This event can be perfectly paired with either of the suggested theme verses to become the main event of the camp games. Opening Ceremony: Assign campers into teams upon arrival to encourage the formation of new friendships. Let the teams “march in” to the auditorium or gymnasium together wearing matching t-shirts (or arm bands or vests) on the first night of camp. You can even include a Torch Relay with campers from each team chosen to carry the torch. You can find instructions for a flameless torch here: Olympic Torch. Team-Building Events: It’s important to drive home the idea of teamwork and cooperation to teen campers. Having different events and exercises within the teams can create stronger bonds among team members and aid in their performance in the larger events. Medal Ceremony: Close your Olympic themed youth camp on a grand note with a ceremony to recognize winning teams and/or individuals. Honor first, second and third places in events with inexpensive medals like the ones available on Amazon. Ribbons can be given for all participants or you can create specialized categories (Best Team Spirit, Most Enthusiastic, Best Attitude, etc.) to be sure everyone goes home with an award. An Olympic themed youth camp can be a useful tool for getting teenage campers to participate in activities and make new friends. Teamwork, discipline and endurance are all part of the Olympic spirit. Those ideas translate well to biblical principals in order to challenge teen campers both physically and spiritually. Special thanks to Camp Aldersgate for sponsoring this post.